Watch Education: What Exactly is a Perpetual Calendar Watch? A. Lange & Söhne’s Datograph Perpetual watch ($164,800) is crafted in platinum and consists of 556 parts. Accurate to a rate deviation of only one day in 122 years. Ulysse Nardin, this platinum El Toro GMT +/- Perpetual Calendar watch ($69,900) is created in a limited edition of 500 pieces.IWC Big Pilot’s Watch Perpetual Calendar Top Gun ($38,600) houses a host of complications, including a perpetual calendar with four-digit year display, moon-phase display in both the northern and southern hemispheres. One of the most sought-after complications on today’s watch market is the perpetual calendar. These sophisticated time trackers typically hold calibers with anywhere from 300 to 600 pieces and command prices that range from $25,000 to hundreds of thousands of dollars, depending on their added functions and adornments. Waiting lists for these watches can run several years—a drop in the bucket, really, since these complex movements can stay accurate for more than a hundred years. Essentially, the perpetual calendar tracks and displays the day, month, date, and year with automatic accuracy. With the exception of a few that will run for centuries, today’s perpetual calendar watches typically are built to track time until March 1, 2100. At that point in time, the leap year that should occur will be skipped, so the watch will need an adjustment. The highly complex technical calibers of these watches are composed of date wheels, date-change levers, day wheel, and day-of-the-week lever, as well as an intermediate month wheel with month rack disk and finger that tips the month accordingly at the end to change it to the first of the new month. 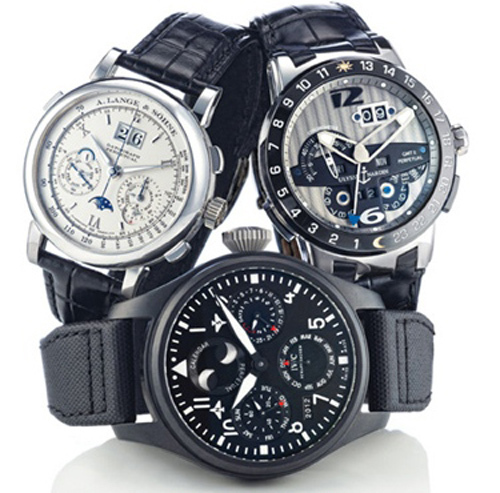 Some watches also offer year and decade disks, and a moon-phase indicator. The entire labyrinth of disks and levers is linked together, so that every night a switching impulse is transmitted from the main movement of the watch via a tiny lever, pulling on the date-change lever. This impulse causes the date wheel to advance by one position. Simultaneously, the day-of-the-week lever pushes the day wheel, and so on, in turn. 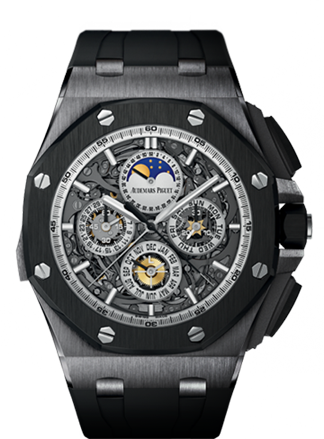 Audemars Piguet Grande Complication Royal Oak Offshore with perpetual calendar, minute repeater, split-seconds chronograph. Certain difficulties arise in the making of these intricate, labyrinth timepieces with regard to setting the functions and readouts of the watch. Thus, many of today’s finest watch brands have created unique, patented mechanical systems for setting the dates and times, for unusual readouts, for extended time indication, or for added functions such as chronographs, astronomical indicators, or multiple time zone indicators.